How do you organize your Social Media activities? Most people have a system – whiteboards, excel documents, Google Calendar, or often, scraps of paper. Unfortunately, none of these are particularly effective, nor are they efficient. And they certainly don’t help you share your activities with your colleagues. 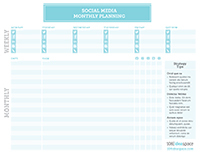 Our take on scheduling and planning: Social Media activities can be planned either cyclically (every week, month, year), or keyed to a planned event. Of course, great social media should also respond to external stimulus – client queries, news events, etc – but this is more reactive than pro-actively planned. Planning for Cycles: The traditional way follows a monthly calendar, where specific activities are calendarized to occur on specific dates. Blog on the 4th, 7th, 9th etc. Tweet daily. Change LinkedIn Status on the 1st, 6th, 15th, etc. Each specific day has an action plan. A slight variation is to calendarize by week, and then list any month-based activities. For example, a new blog post every Monday and Thursday, LinkedIn is Wednesday, Tweeting is daily. Then list month-based activities by date: New pictures loaded on Facebook on the 1st of the month, review LinkedIn connections on the 15th, add to Pinterest on the 30th, etc. Doing it this way saves time: the one document can be reused each month with little or no change. 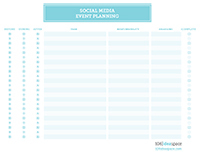 Planning for Events: Social Media for events happen before, during, and after the event. Responsibilities are sometimes delegated to committee members, and they have deadlines. The event planning document must reflect this. Finally, a planning calendar should help connect the initiative’s overall goals to the specific tasks, and then to the results. This week’s action plan: Can you do better with your Social Media tactical scheduling and communications? If you’re using the scraps-of-paper approach, you certainly can. But if you have the problem under control, try a slightly different approach anyway: it often can yield better results. If you don’t have a copy of our our planning calendars and worksheets already, download them (no cost), and give them a try. 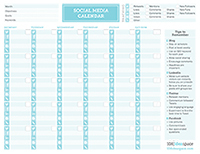 Download Social Media Calendar three-pack. Previous post: Are Resumes Dead?